The final element associated with the construction of my portfolio is an attempt to assess whether the stock market is overvalued or undervalued. I am doing this as the stock market can be a highly volatile / high risk place and if I can take a calculated risk here I might be able to squeeze some more performance out of my portfolio. I will try and be underweight equities when the market appears overvalued and overweight equities when the market appears undervalued. This could be likened to timing the market which history suggests is difficult/impossible meaning I may also end up under performing compared with the traditional buy, hold and rebalance periodically strategy. Only time will tell. The method I am going to use is that developed by Yale Professor Robert Shiller. He uses a very simple method where he looks at the monthly real (after inflation) market price of the S&P 500 and divides it by the average of the previous 10 years real earnings to get a long term historic real price earnings ratio (Shiller PE10). The real price and Shiller PE10 look to have a relatively high correlation of 0.78. 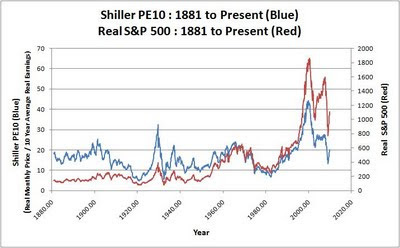 A chart showing both the Shiller PE10 ratio versus the real S&P 500 can be seen below. The December 09 entry is the market close on the 04 December. My current Shiller PE10 estimate will always appear slightly different to Shiller as I use the Standard & Poors website to also enter forecast earnings estimates up to the month of interest. Since 1881 the average Shiller PE10 value has been 16.35. Another way I have looked at this is to plot a scatter diagram of the Shiller PE10 versus the return made in 12 months time shown below. This I have calculated as the ((Price in 12 months – Price)/Price)+(Dividend in 12 months)/Price). While the R^2 value is quite low a trend line suggests there may be something to be had. While I will use the average Shiller PE10 value I won’t go silly. 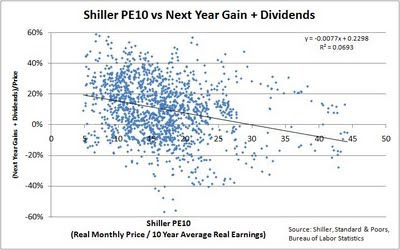 I will try to squeeze some performance by on a linear scale will owning 30% less stocks when the Shiller PE10 average is Shiller PE10 Average + 10 = 26.35 and will own 30% more stocks when the Shiller PE10 average is PE10 average -10 = 6.35. I will use this methodology as a proxy for all my International Equities and United Kingdom Equities as Hale suggests a high correlation between UK Equities and International Equities and I have struggled to find good historic data for UK, European and Japanese equities. Today’s Shiller PE10 is 20.2 meaning that instead of holding 21% UK Equities today my target is 18.6%. Similarly instead of 15% International Equities today my target is 13.3%. For my Australian Equities I have been able to find some Inflation and ASX 200 data from the Reserve Bank of Australia. Unfortunately all the data needed only starts from 1982 which is not a long time ago. Even so I have calculated and show what I will call the ASX 200 PE10 chart versus the Real ASX 200 below. I have estimated average ASX 200 PE10 to November 2009 to be 18.5. 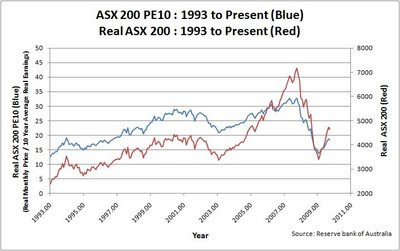 The correlation between the Real ASX 200 and the ASX 200 PE10 appears high at 0.82. For my Australian Equities I will use a nominal ASX 200 PE10 value of 16 to equate to when I hold 21% Australian Equities. Otherwise I will use the same assumptions as for the UK and International Equities. Therefore with an ASX 200 PE10 of 18.5 today my target is 19.3%. When I am underweight I intend to hold the extra in bonds/cash. For my emerging markets equities because it is a small amount I will not vary the weighting but always target 5%. Interesting site - thanks. Your approach (& situation) is not dissimilar to my own. One difference though is that I have tilted my portfolio towards Value & Small companies based on the work of Fama & French. See http://en.wikipedia.org/wiki/Fama%E2%80%93French_three-factor_model ) Have you considered this approach & ruled it out?